The crust is the only part of this elegant dessert ensemble which is baked. Luscious filling made from a mixture of ice cream and pumpkin is chilled with a whipped cream topping. For Crust: Combine crushed cookies, butter and sugar in small bowl. Press onto bottom and sides of 9-inch pie plate. Bake for 8 minutes. Cool completely. 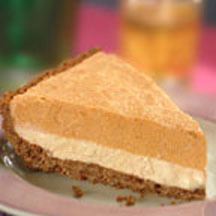 Spread ice cream over gingersnap crust. Freeze for 2 hours or until firm. For Filling: Combine pumpkin, sugar and pumpkin pie spice in medium bowl. Beat whipping cream and vanilla extract in small mixer bowl until stiff peaks form; fold into pumpkin mixture. Spoon over ice cream. Freeze for 1 hour or until firm. Serve with Pumpkin Topping. For Topping: Combine caramel or butterscotch sauce, pumpkin and pumpkin pie spice in small bowl.